Dr Rosalys Coope, Vice-President and former Chair of the Thoroton Society, died at Christmas - her family were with her. She will be missed by her many friends in the Society. The Thoroton Society Data Privacy Notice has been released. It explains how we use members' personal data to ensure we comply with the Data Protection Act 1998 and the EU General Data Protection Regulation. The Thoroton Society is the county’s principal historical and archaeological society. 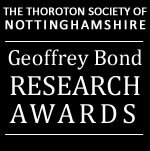 It has a long pedigree, having been established in 1897, and is named in honour of Dr Robert Thoroton who published the first history of Nottinghamshire in 1677. The Society’s aims are simple: to promote knowledge, understanding and appreciation of the history, archaeology and antiquities of Nottinghamshire, and to support local research and conservation. A lecture series on topics relating to the county. Excursions to sites of historical and archaeological interest. The Society’s prestigious annual publication, The Transactions, containing the latest historical research. Occasional publications in the Record Series. An annual luncheon and other special events. Meeting like-minded people and getting involved in exploring Nottinghamshire’s fascinating past.